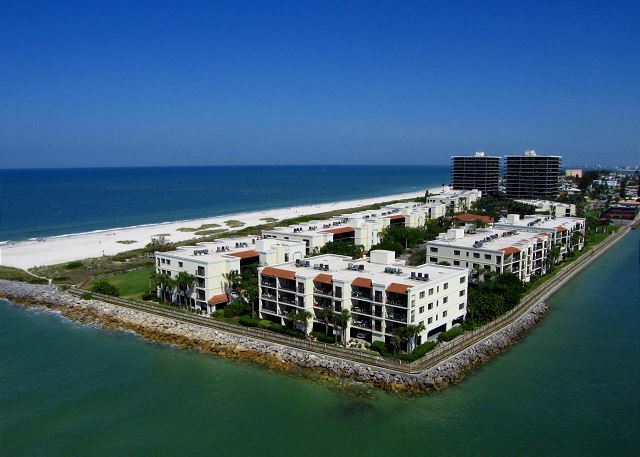 Breathtaking views of the Gulf of Mexico welcome you to Florida when you stay in this inviting condo. 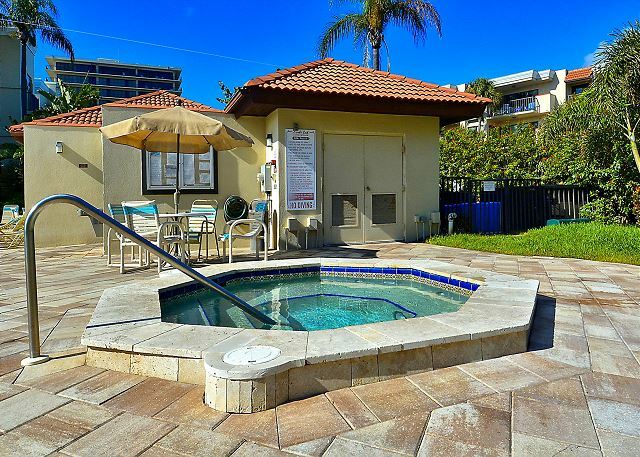 The warm décor coupled with cooling tile throughout, unite the comforts of home with beachfront living. The stunning kitchen offers granite counter tops and a wide open view of the living area and balcony. In addition to the Dining area there is a cozy breakfast nook for your use. 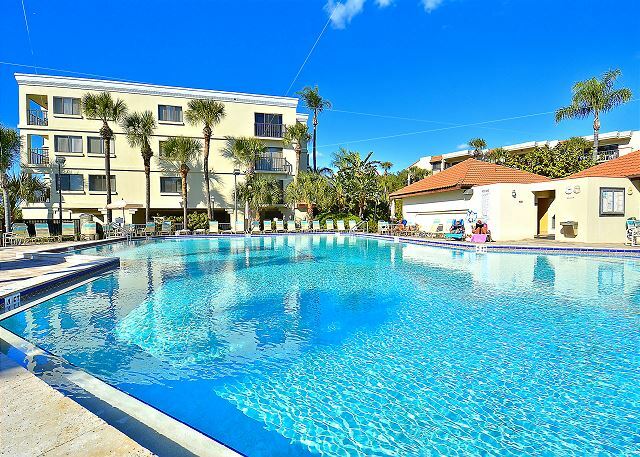 Other amenities include a washer and dryer, a flat screen TV and wireless internet service. We had a wonderful month at Lands End! There were some housekeeping issues and some missing items, to which Resorts Rentals promptly responded. My only negative comment is that housekeeping should be more thorough when preparing for the next tenants and not take shortcuts with regard cleanliness. Thank you for these comments and we definitely shared them with our staff and do apologize if things were not up to par as they should have been for you. Thank you for calling us though so that we could get this corrected, we want to be sure you are totally comfortable during your stay so thank you for letting us address this. Thank you for being a repeat guest with us, we enjoy having you and look forward to the next visit! We have stayed at Lands End many times and love ❤️ the location. Sunsets are spectacular and the area suits us perfectly. There are lots of restaurants nearby and plenty of shopping when we need a break from pool and beach. Resort Rentals staff respond quickly to any problems in the unit and are helpful when checking in. We are so glad you enjoy your time while you are here, Land's End really is pretty special! :-) Thank you so much for being our guest and we sure hope to see you back again next season. We were happy with the whole experience. The condo was very clean, well maintained, comfortably furnished and beautifully decorated.. The best part was the spectacular sunset view. The view was unobstructed, and very private, with a walk out balcony from both the living area and the master bedroom. The rental process was simple and the customer service was remarkable! All in all a very relaxing and satisfactory vacation....we are happy to recommend it to others. Wonderful to hear, thanks for sharing!! :-) We are so glad you enjoyed your stay in the premier beachfront condo at Land's End and were comfortable during your stay. Thank you for choosing to stay with us and we hope to see you back for another visit soon! This is our second vacation at Land's End and we will definitely be back. This was our Honeymoon Vacation and we and our 20 friends thoroughly loved the place and amenities provided. A special highlight for us was the wonderful gift bag presented to us from Gail and the staff at the Blind Pass Road office. The prices are reasonable and if you enjoy a peaceful, relaxing location we highly recommend a trip here. Building Accommodations staff at Resort Rentals outstanding. Thank you for your post and kind words about our staff!! :-) We are so glad you enjoyed this premier condo and we look forward to having you back again soon! Wonderful to hear!!!! :-) See you back on the beach in just a few months! Private location at the south end of Treasure Island. 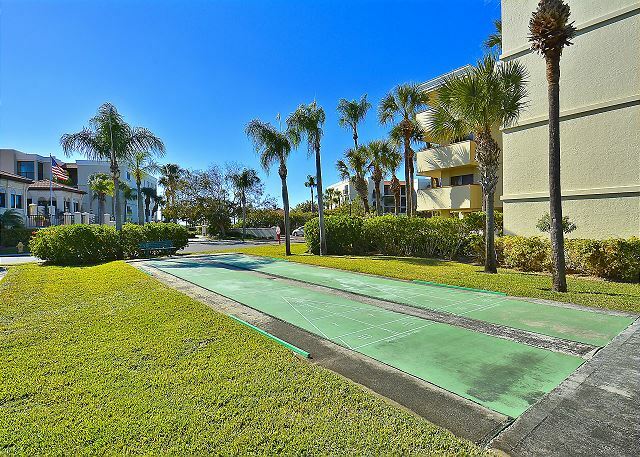 This facility is excellent for those looking to walk the beach, hang out at the pool, and have a relaxing vacation. There is a full service supermarket within 2 miles, and many great restaurants within a short distance, some a short walk. The condo was comfortably furnished, and easy to maintain. It was supplied with all the cooking and dining essentials, and a starter set of cleaning and maintenance items. The staff at the facility and the rental agency were excellent and extremely helpful. The one recommended change would be to supply larger fitted sheets for the bed, as we ended up tangled in the sheets each morning! First of all, the property location is fantastic. The grounds and pool area are impeccably well kept. We were able to capture beautiful sunsets from our condo and enjoyed getting away from the January Northern Ohio winter even if it was only for a week. The first couple of nights we had heating issues with getting any ciculation to the bedrooms. We called the first night because of the smoke that came out of the vents when the heat was first turned on which actually triggered the smoke alarm. The first few evenings the temperarure was in the 40 degree range outdoors. We called on Sunday and reported it to the answering service but did not hear from anyone until Monday. Someone did come to look at the unit and said it was ok. Yes, the furnace turned on, but circulation was minimal in the bedrooms. I ended up closing the registers in the living area to help alleviate the problem. There is also some water damaged ceilings, bed sheets are poor and would pull off the mattress, the toilet seats are worn and should be replaced and our daughters said the guest bed mattresses were not comfortable. In other words, the place needs a little TLC to be considered Premier. Thank you for your feedback from this condo! We have passed this over to the owners for their review and knowledge and we truly apologize for any troubles you ran into. We have spoken to our answering service and please accept our apologies that the call was not dispatched out to us on Sunday as it should have been. We do understand as well that everyone's bedding preferences do vary, but we are sorry if the girls were not comfortable in the guest beds and we will take a look at them, as well as the other items that you have mentioned. We have many condos in our program to choose from in all view categories, if this one was not the perfect fit for you we are sure we have one that is!!!! :-) Give us a call when you are ready to plan your next Land's End visit and we would be happy to provide you with options! We absolutely enjoyed our vacation. The atmosphere was peaceful and beautiful. The property is well maintained and private. So glad to hear you enjoyed your vacation at Land's End in this AWESOME premier condo!!! :-) The condo association really does a great job in maintaining the grounds and we are just thrilled that you enjoyed it all the way around! Thank you for staying with us and we look forward to having you back for another beach vacation! Lauryi K from Knoxville, TN does not recommend this vacation rental. We rented a total of 4 condos to accommodate 13 people for a week. Out of all the condos, this one was the most dated in décor, especially the blind which were pretty much beyond their useful life. An AC problem occurred, but it was promptly corrected within a couple of hours and the condo recovered a comfortable temperature by bedtime. The couple that stayed in this condo are New Yorkers with fairly low needs regarding modern amenities and air conditioning. However, even they mentioned that the blinds were shot (falling down from clips every time they were used, etc. ) and should be replaced. They were still pleased with the accommodations, as were we and did not mention the problem with the blinds to anyone until now. Bldg. 10 Unit 304 at Land's End was very enjoyable! 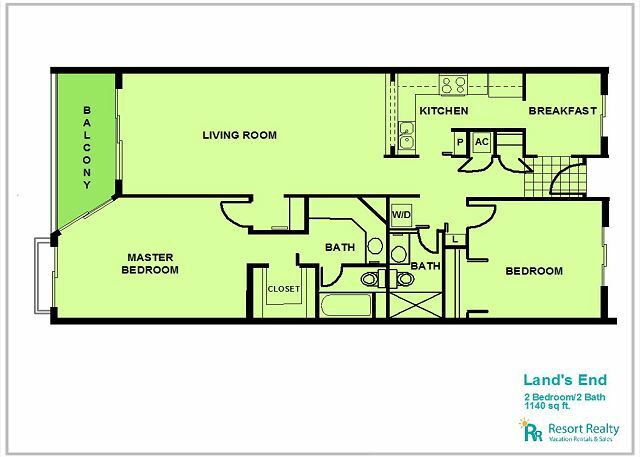 We are so glad to hear you enjoyed this premier condo at Land's End!! :-) We do apologize if the bedding was not a good match for you. We do understand that everyone's preferences in that area do vary but, we will be sure to pass this over to the owner for review. In regards to the TV functions, we are sorry if it was a bit tricky and if you ever need help with things, please do not hesitate to contact us at our office and we would be more than happy to assist you. Thank you so much for choosing to stay with us and we hope to have you back at Land's End again very soon! Awesome!!! :-) Looking forward to the next visit! We had one of the best FL-vacation at Lands End. We were very happy with the location, the facilities, the safety, cleanliness, the beach and the weather. we only had several minor maintenance issues. I informed the resort management in detail during check out. We already recommended Lands End to our neighbors. 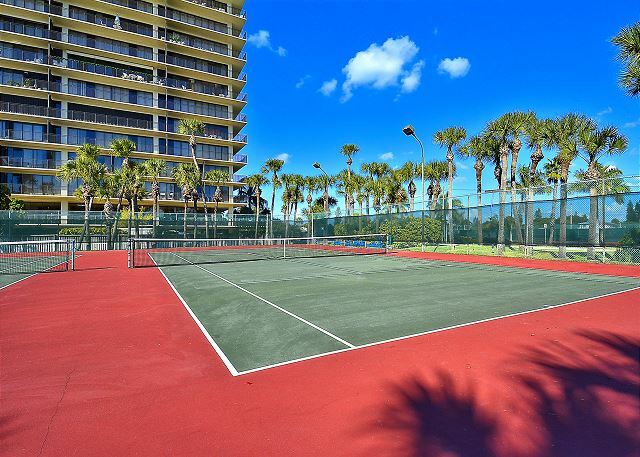 This newly remodeled two bedroom condo with its gulf view is only a few footsteps away from the pool and gulf. The grounds are exceptionally clean and groomed. It was a beautiful condo. Great location. The balcony furniture could use some updating. Not really comfortable. Missing dead bolt lock on inside. Night table drawer front was laying on floor when we arrived. Other than that, it was very good. We plan on coming back to the same unit. The unit had a semblance of acceptance when the 4 of us(Rudy, Janet, Barb and Lee) were through with it. Great time. Didn't want to leave. We'll be back next October. Minor problems were quickly remedied by the real estate agent. the home and location are lovely. Thanks for your review. I apologize for the problems you encountered but am glad we were able to rectify them quickly. Thanks again and we hope to see you again next year! The air condition does not work well specially in the main room. Thank you for your review. I do apologize for the issue you had with the air conditioner. If at any time anything is inoperable in your condo or not working to its fullest extent, please give us a call. It is never an issue for us to send a repair man out to rectify any problems. Thanks again and we hope to see you soon! We had a very nice vacation at Land's End. Great location with easy access to the beach. Superb pool and hot pool with pleanty of sunbeds. Property in good condition and well furnished (dishwasher, washing machine, dryer, and so on). Quite and safe area. We're certainly coming back to spend some more vacations there! It's like a private house on a deserted end of beach!! Our second stay in this unit. They have replaced the old couch and love seat. This make this unit perfect and very updated. This is the first time we have witnessed a pool monitor during our stay and they did a very professional job of enforcing the rules and regulations without making a big deal out of it. Location very good. Management very good. Clubhouse activity lacking. Need fitness centre. Land's End is the preferred location for our winter getaway. 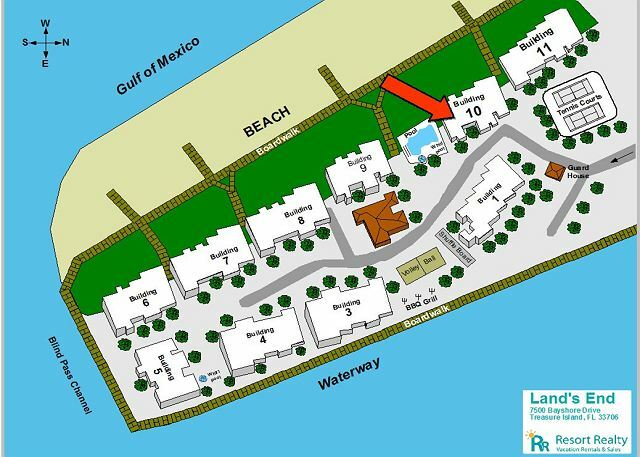 The semi-gated location on the Gulf feels secluded from the busy area beyond it and the largest heated salt-water pool in the area keeps us coming back. We hope that our health will enable us to visit for several years to come. Other guests staying there are very compatible. Our second stay at Land's End. Another happy result. After staying at numerous places in the Madeira Beach/Treasure Island area, Land's End has become our favorite. Overall, this unit was nice. Updated kitchen and bathrooms were a big plus. The only negative were the couches in the living room. I think they've reached the end of their life cycle and need to be replaced. Other than that, this condo was great. Everyone at Resort Rentals was wonderful and very accommodating. We look forward to returning to Land's End next year! The unit and all the property were top notch my wife have stayed in Florida well over 30 times and this was our first to Lands End and it will not be our last. We are already talking about our next trip down to what we call paradise. All the people were so nice you felt special. Cant wait to come down again next year. I thoroughly enjoyed my stay at Land's End! It is a beautiful property with a lovely pool/spa area and quiet, lush grounds. The sounds of wildlife remind me of Costa Rica! The accommodations are great and the location is very close to everything but away from the noisy, crowded beaches. It was truly a relaxing vacation and I can't wait to go back!! Thank you again!! #304 building 10 is an updated unit and Kitchens and Baths are very nice. As in other reviews of unit the sofa and love seat in living area are very dirty and stained. They either need replaced or professionally cleaned. Some of the pool side chairs need replaced as are rusted and paint coming off. I saw a couple of new ones, but many more need replaced. Resort rentals is a great Management company. We have already booked two more stays at Lands End with them. Thanks so much for your great review. I appreciate all your kind words. I do apologize about the condition of the sofa and love seat. We have made arrangements for them to be professionally cleaned. Look forward to hosting your stays in the future! Greg and Bonnie's Vacation at Lands End April 2013. Everything was wonderful. The only problem we had with the UNIT was that Sofa and Love Seat were very dirty. They badly need to be cleaned. Other than that the Unit was excellent with many upgrades and overall cleanliness, other than the above,was good. We look forward each year to visiting Land's End for a few weeks and meeting up with our 'winter friends'. It's like coming home. We enjoy the serene setting and the fabulous swimming pool. 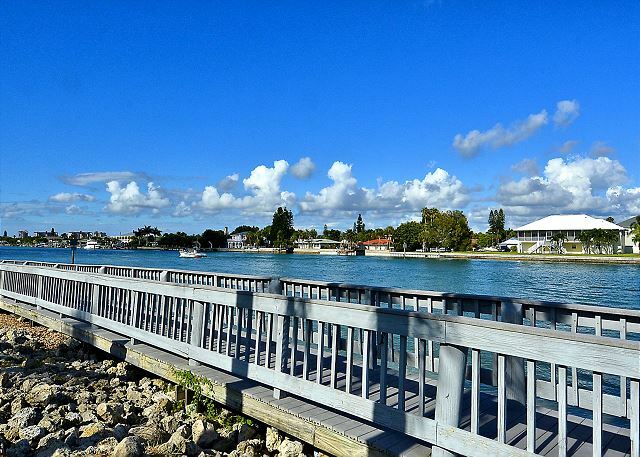 Land's End is Florida's best kept secret. This unit has been remodeled with a super kitchen and lovely baths. There is a full size stackable W/D which was very helpful while staying on the beach. We love this area, as there is no traffic noise, and the pool is well maintained. The beach is beautiful and the sunsets spectacular!